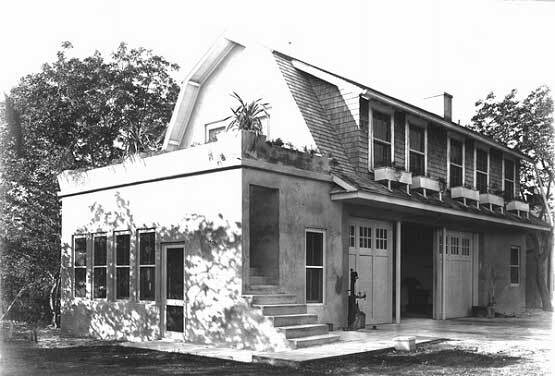 The Richmond Cottage, originally built in 1896 as a two story balloon frame vernacular home for S. H. Richmond and his family, is one of the oldest wooden structures in Miami Dade County and the last remaining structure of the former town of Cutler. In 1899, a three story gabled addition transformed the home to the areas only inn and it became an outpost for visitors conducting the business of Henry Flagler’s East Coast Railroad. The Richmond closed for business in 1915 and was soon after purchased and renovated for a winter home by Charles Deering. Over the next 2 years Deering added the Carriage House, Pump House and Power House to complete his self-sufficient homestead, enclosed his estate with limestone and concrete walls and built the Chinese Bridge and Deering family signature boat-turning basin. His final structure, the three story Mediterranean Revival Stone House, designed by the Coral Gables architect Phineas Paist, was completed in 1922. With 18-inch poured concrete walls, coffered ceilings and centuries old iron fixtures it echoed his former Old World residences at Sitges and Tamarit, but it also featured modern conveniences including a new Otis elevator. The Prohibition Era wine cellar secreted away Deering’s extensive collection of spirits and the East facing balconies and French doors provided the beauty of sunrise views and comfort of bay breezes. It was a showcase for his massive art collection and a peaceful place for him to live out his last remaining years.